Endemic to the Western Ghats of the Kerala region of India. Unlike many other nandids, this species inhabits flowing waters, such as fast-moving streams and rivers and even some whitewater areas. An aquarium with a decent flow rate, decorated with a sandy substrate, smooth rocks and driftwood roots would simulate the natural habitat of P. marginatus. It is equally at home in a stiller, planted aquarium as well. Generally a carnivorous species but will also take nuts and seeds in nature. In the aquarium it is quite an unfussy feeder, accepting most dried, frozen and live foods. This fish will probably swallow any tankmate small enough to be seen as food. It can also be a little on the belligerent side, so it’s best mixed with similarly-sized or larger species that appreciate flowing water. Possibilities could include silver or apollo sharks. No external differences, until the females are in spawning condition, at which point they become noticeably rounder in appearance. Just prior to spawning, a small ovipositor may be seen. Although no data is available on breeding this species in the hobby, it has been achieved in aquaria, and the fish is now being produced commercially in the Far East. 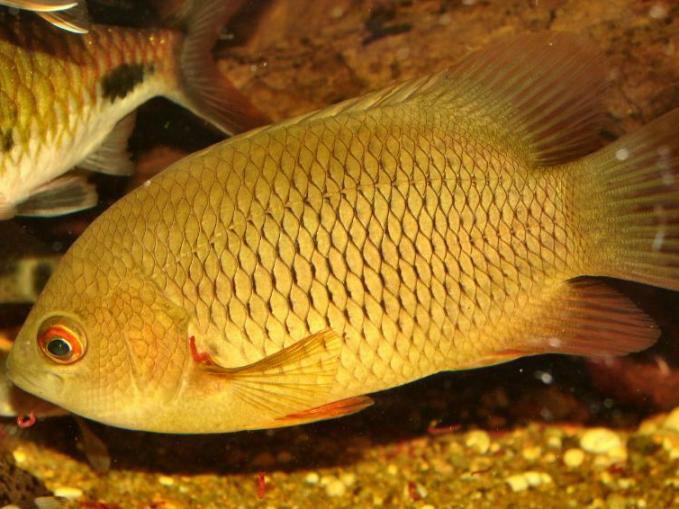 Apparently, the fish breed in a similar fashion to many cichlids, with the male constructing a pit-like nest from pebbles, into which the eggs are deposited by the female. There’s an extended courtship display prior to this, involving some physical contact and a lot of body quivering. The female returns to the nest several times over a period of a few hours, swimming side-by-side with the male and depositing a batch of eggs each time. She then takes no further part in brood care, with the male guarding both the eggs and subsequently the fry, until they become free-swimming. During this time he may change the structure of the nest until it is simply a pile of pebbles. The male in particular shows a strong increase in aggressive behaviour throughout this period, and a separate tank would probably be required for a successful spawn. Also known as the common catopra, this is still quite a rare species in the hobby, although it’s becoming more readily available due to captive breeding efforts. It makes an interesting addition to the larger community or oddball tank.